Emblem of Quwat Dir’ al-Amn al-Askari as it appears on insignia. The previous article discussed Fawj Maghawir al-Badiya, a militia affiliated with the Military Intelligence Branch (Shu’abat al-Mukharabat al-Askariya). This piece looks at another militia affiliated with regime intelligence: Quwat Dir’ al-Amn al-Askari (“The Military Security Shield Forces”). As the group’s name suggests, it is affiliated with al-Amn al-Askari (“The Military Security”), but it should be noted that there is no real difference between the Military Intelligence Branch and the Military Security. 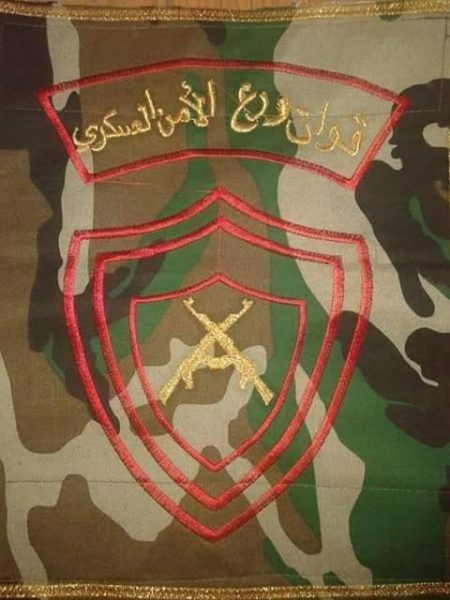 In the present day, the two names just refer to military intelligence affiliated with the Ministry of Defence, but at the provincial level the brand and nae of al-Amn al-Askari seem to be more recognisable. In the case of Quwat Dir’ al-Amn al-Askari, it appears that we can identify a more geographically specific affiliation: that is, branch 223 of the Military Security based in Latakia province. This branch has been identified before in the militiafication phenomenon for its involvement in the provision of arms and arm-bearing ID cards to members of the Popular Committees in Latakia province. 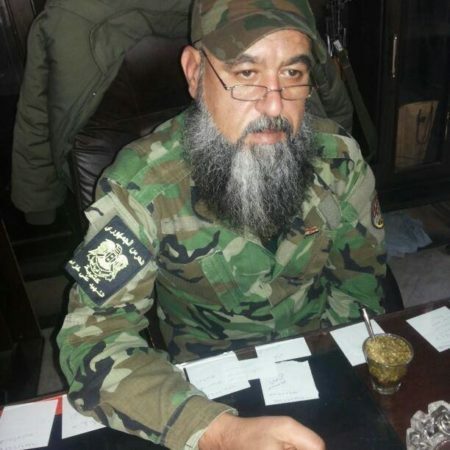 Considering its specific affiliation, Quwat Dir’ al-Amn al-Askari’s first major engagement was unsurprisingly in north Latakia province in the January-February period as part of a Russian-backed offensive bolstered by multiple militias, including Suqur al-Sahara’, Liwa Usud al-Hussein and the Iraqi Shi’i Liwa Assad Allah al-Ghalib. Though this offensive gained significant ground against the rebels, it ultimately failed to expel them entirely from the province. Even so, the head of branch 223 of the Military Security based in Latakia province received an award from the Russian and Syrian commands on account of his supposed role in the operations and presence on the battlefield while rejecting media appearances. 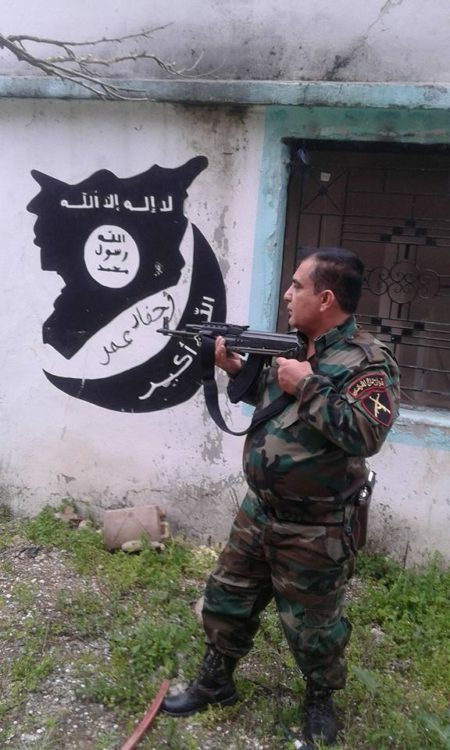 Quwat Dir’ al-Amn al-Askari fighter in Kanasba, Latakia, posing outside what appears to be a Harakat Sham al-Islam base. Photo from February 2016. The next major campaign involved deployments from Latakia to the deserts east of Homs in order to participate the recapture of Palmyra from the Islamic State in March 2016. These operations featured recognisable appearances from a commander in Quwat Dir’ al-Amn al-Askari: a man going by the name of al-Khal Abu Ismail (al-Khal translating as “The Uncle”). There was also some display of brutality in featuring at least one photo with a severed head. In the centre: al-Khal Abu Ismail. 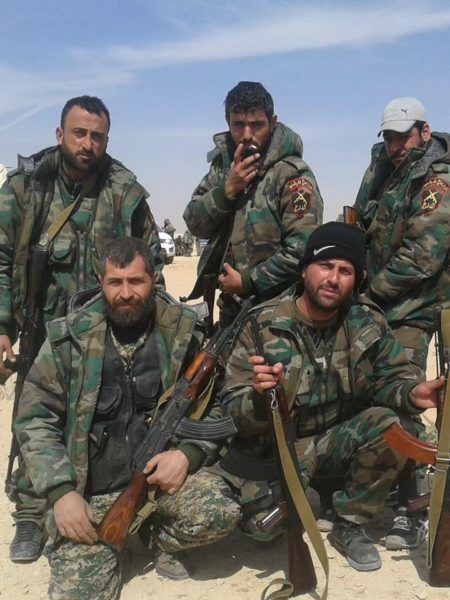 Quwat Dir’ al-Amn al-Askari contingents continued to remain deployed in the Palmyra area through the rest of the spring and into the summer. In June 2016, some fighters participated in a regime offensive against the Islamic State launched from Athiriya Raqqa province that aimed to push towards the Tabqa area, backed by other militias like Suqur al-Sahara’, Fawj Maghawir al-Bahr and the Syrian Social Nationalist Party’s Nusur al-Zawba’a. This offensive ultimately failed, as the Islamic State launched a counter-attack and routed the regime forces and its allies from the province. July 2016 saw reports of fighting on the part of Quwat Dir’ al-Amn al-Askari contingents in Latakia and the Aleppo city area. The former, which is ongoing, began with a rebel offensive that seized the locality of Kanasba by the start of July 2016. The Aleppo fighting, which also continues to this day, is part of the regime’s initiative to try to encircle the rebel-held eastern part of the city and impose a siege, currently undermined by a Jaysh al-Fath-led counter-offensive that opened up a new corridor to eastern Aleppo via Ramouseh in the southwest of the city. The first phase of the operations involved fighting on the northern fronts of the city, including al-Melah, Bani Zaid and the Castello road. As mentioned previously, these operations have entailed close cooperation with the Syrian Resistance. As part of this phase, the Syrian Resistance affirmed at the end of July 2016 that it had sent up reinforcement contingents from Hama to reinforce the Castello road front, where cooperation was occurring alongside the Quwat Dir’ al-Amn al-Askari. 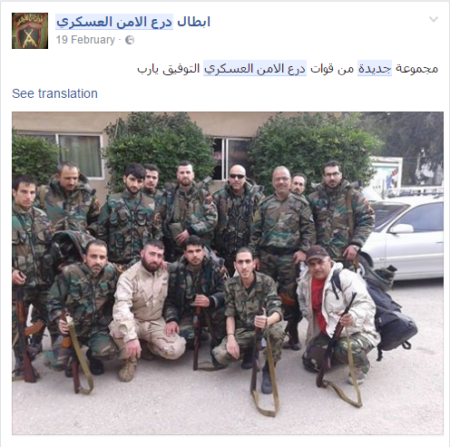 A Quwat Dir’ al-Amn al-Askari Aleppo contingent leader presented in these accounts is one Mudar Makhlouf, who has long been known for his Military Security affiliation and appears to be most distinguished for leading Military Security militia contingents in Deir az-Zor, for which reason a fan page dedicated to him refers to him as Azra’il al-Dawa’ish (“The Angel of Death for the Da’ish people”) in reference to fighting between regime forces and the Islamic State. 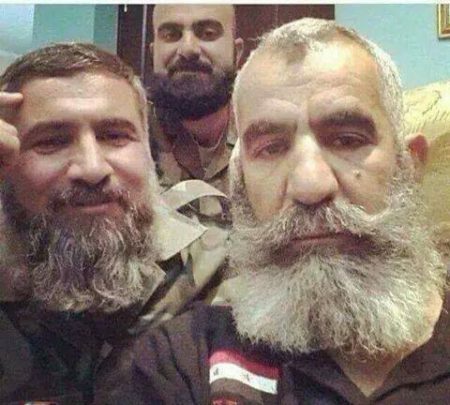 A photo featuring Mudar Makhlouf (left) and Issam Zahr al-Din (right), a Druze commander in the Republican Guard deployed to Deir az-Zor. As the Jaysh al-Fath counter-offensive made gains against the regime to the southwest of Aleppo city in early August, one of the Quwat Dir’ al-Amn al-Askari pages claimed that the group had sent 400 fighters to assist the Syrian army on the military colleges front in that area, though that initiative did not prevent the breaking of the siege. The militia has continued to claim involvement on the southwest Aleppo front particularly in the area of those military colleges, but the corridor opened by the rebels has not yet been fully closed. These operations, as in the earlier phase on the northern front, are being coordinated with the Syrian Resistance. Another force coordinating with Quwat Dir’ al-Amn al-Askari on this front is one known by the Arabic acronym Qadish, which stands for Quwat al-Amn wa al-Da’am al-Sha’abi (“Popular Security and Support Forces”) . These forces serve as auxiliary militias affiliated with the Republican Guard. For its efforts on the Aleppo front, the head of the 223 branch of Military Security has notably paid special tribute to Quwat Dir’ al-Amn al-Askari, further pointing to links between the two. 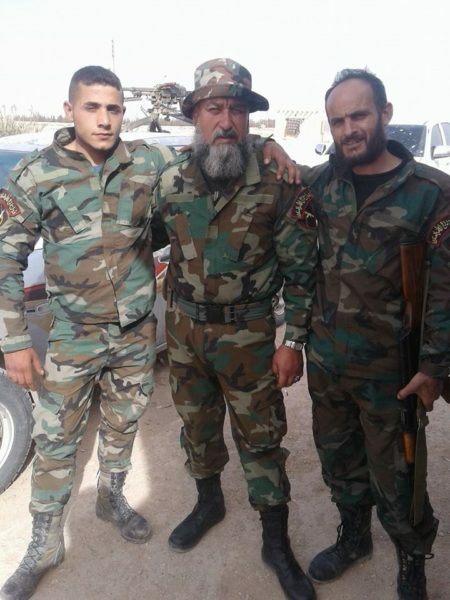 Finally, in terms of operations, it should be noted that a contingent of Quwat Dir’ al-Amn al-Askari under the field commander Hassan Mahfoudh (otherwise obscure) is reported to be deployed most recently to Hama province as part of countering the Marwan Hadid offensive in north Hama countryside led mainly by Jund al-Aqsa, Abna’ al-Sham and Jaysh al-Nasr. 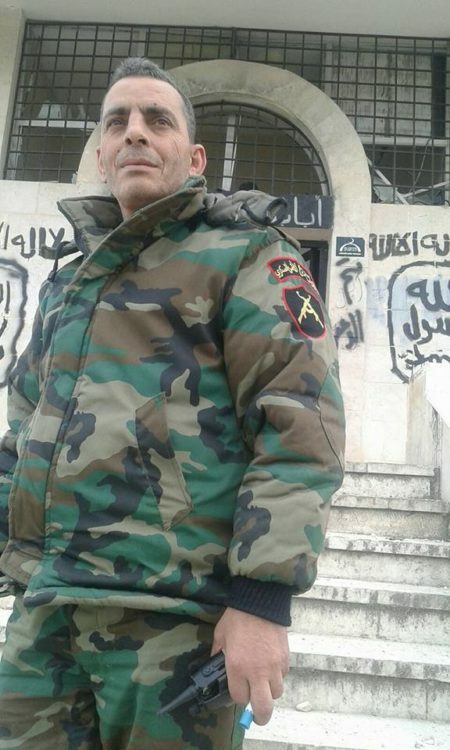 A Quwat Dir’ al-Amn al-Askari fighter posing outside what appears to be a base for a rebel group in Latakia: Katibat Ahfad Omar. Photo from a personal account. It can be seen from the overview of Quwat Dir’ al-Amn al-Askari that the military intelligence’s involvement in organizing militia efforts is not exactly a new phenomenon. This is foremost apparent in Mudar Makhlouf’s prior efforts in Deir az-Zor, as well as the military security Latakia branch’s prior interactions with the Popular Committees. That said, it appears the formation of Quwat Dir’ al-Amn al-Askari as a distinct formation and brand represents an attempt by the military intelligence branch in Latakia to build its influence, while fitting into the wider trend of compensating for manpower shortages on the regime side exacerbated by draft evasion.